Danny Amendola is only on the Patriots roster, most likely, because of his onerous contract — and he’ll have to earn his keep after a rough 2013. FOXBOROUGH — There’s a little bit more of an edge to Danny Amendola’s answers this spring. One harsh winter in New England will do that. 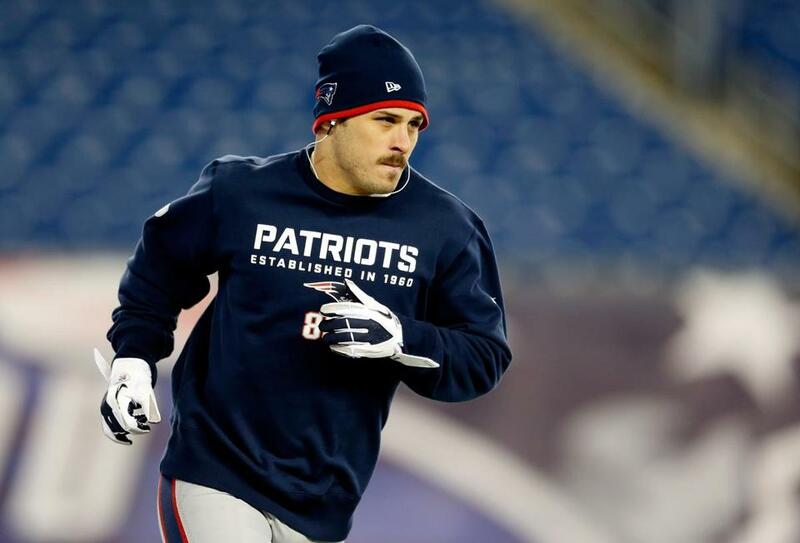 Amendola is back for Year 2 with the Patriots, working quietly to shake off a rough 2013 season. Last year at this time, he was the most exciting new player on the team, signing a five-year deal worth $28 million to replace Wes Welker. This year, he’s working to get back into the flow of the offense and the good graces of the fan base after an inconsistent and injury-plagued season. Amendola was the subject of trade and cut rumors this offseason, and probably was saved by his onerous contract. He doesn’t want to say much about last season, other than offering one simple message to Patriots fans. That was supposed to be Amendola catching 105 passes for 1,056 yards last year as the “new” Welker. That was supposed to be him winning over legions of fans and getting a funny nickname from Tom Brady and making “Burgertyme” videos. Instead it was Julian Edelman who ascended into that role, thanks as much to Edelman’s elite skills and good health as to Amendola’s injury luck and struggles with the Patriots offense. After getting a nice $6 million signing bonus and $10 million guarantee last year, Amendola was pretty much the same player for the Patriots as he had been for the Rams: occasionally great, often banged up. In 12 games, he caught 54 passes for 633 yards and two touchdowns — right in line with his best two other seasons, when he had 666 and 689 receiving yards. But nowhere close to the expectations. Injuring his groin in Week 1 and being forced to sit out the next three games hurt his progress. He did have three 100-yard games, but Amendola really had only one other game in which he was a significant part of the offense — the Week 15 loss at Miami, when he had 10 catches for 131 yards. Otherwise, he took a back seat to Edelman, who soared past Amendola as Brady’s most trusted target. By the AFC Championship game, Amendola also had fallen behind street free agent Austin Collie on the depth chart, and was targeted only once by Brady the entire game. A lot was made last year about how Brady had so many young receivers — Aaron Dobson, Kenbrell Thompkins, Josh Boyce, and others — who needed to adjust to the complexities of playing wide receiver in the NFL. Turns out that Amendola, who entered the NFL in 2008, was having many of the same problems. The Patriots offense requires a lot of communication between Brady and the receivers at the line of scrimmage and even after the snap to adjust routes based on the coverage being shown by the defense, and Amendola struggled to get on board with Brady in their first year together. More like the Patriots have to grit their teeth, force a smile, and say they’re happy to have Amendola back. He was a flop last year given the money he got, and in a perfect, salary-cap-less world, the Patriots would’ve loved to cut bait with Amendola this offseason and use that roster spot on a better player, either in free agency or the draft. But they can’t. They’re pretty much stuck with Amendola for 2014, especially after a $2 million roster bonus was triggered in March. Before June 1, it would have cost the Patriots $6.8 million in cap money to cut or trade Amendola — $2.2 million more than it would cost just to keep him. Now that June 1 has passed, the Patriots theoretically could cut Amendola and spread the money over two years — $3.2 million this year, $3.6 million next year — but they might as well keep him at this point and give him one more year to prove himself. If he doesn’t produce big numbers — think at least 80 catches, 800-plus yards, and a clean bill of health — then Amendola is all but gone after 2014, when he doesn’t have as much dead money left on a contract that runs through 2017. The Patriots, smartly, aren’t trusting Amendola to be a featured piece of the offense this time around. They wouldn’t have given Edelman a $17 million contract with a $5 million signing bonus if they thought Amendola could stay healthy for at least 14 games and expertly work the slot for Brady. They wouldn’t have given free agent Brandon LaFell a $9 million contract with $3 million guaranteed if they thought Amendola could be a trusty No. 2 option. Edelman, LaFell, Rob Gronkowski, and Shane Vereen will be the top options in the passing game entering the season. Dobson, the team’s tallest receiver who struggled with a foot injury but also flashed big-play potential, also will be in the mix once he returns from offseason surgery. Amendola is being paid like a veteran leader, and he’ll be on the field this fall. But he’s not much different from youngsters such as Thompkins and Boyce — trying to learn the system, trying to win over the coaches and quarterback.